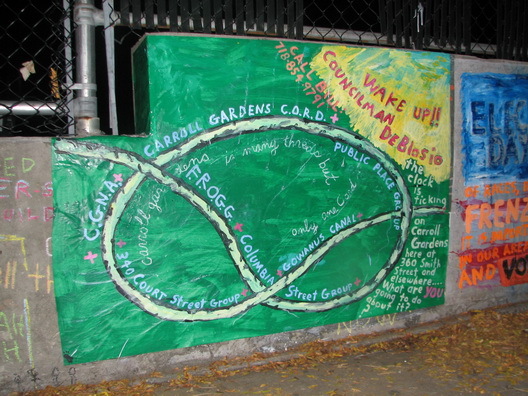 We enjoy the Carroll Gardens Democracy Wall at the Carroll Street subway station. It is part of the now well-known plaza at the Second Place exit that will be closed for construction of the controversial building at 360 Smith Street, which led to both the wall and the CORD neighborhood group. Dozens of message appear on the Democracy Wall at any give time, with the large murals usually being related to whatever issue is at hand in the neighborhood. The newest mural is aimed at City Council Member Bill de Blasio. The email that came with the photo said, in part, "It looks like an awful lot of people in Carroll Gardens are trying to 'Wake up Bill!! '...They seem to be saying: Councilman, the clock is ticking on our beloved neighborhood (as we still know it) and you are STILL ASLEEP at the wheel.....!!" Some residents have lobbied the Council Member (and recently declared candidate for Borough President) to push for a moratorium on some development in advance of a neighborhood downzoning, which he supports. Us, we enjoy the wall regardless of specific content. Every neighborhood should have a busy spot where activists can put up murals, posters and fliers to communicate in a very grassroots way with their neighbors and elected officials about community issues.